compile the library openAFE from its source code. The algorithmic core of the AFE is made of the C/C++ openAFE library, which implements –when possible– multi-threading and parallel computations inside one processor. 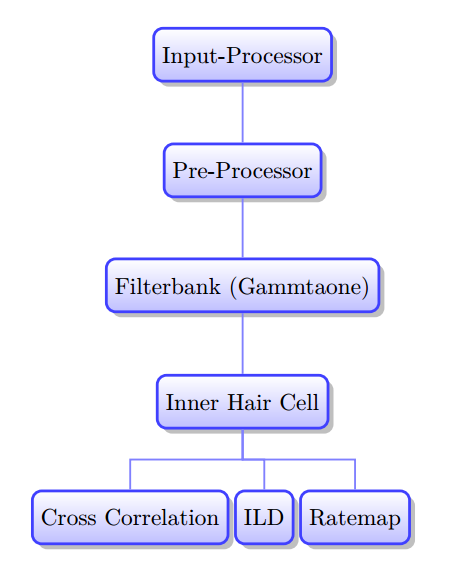 But considering the tree of processor shown in Fig. 9, one can also highlight another level of parallelization between processors. This concurrency property is discussed in the following, together with its actual implementation. Fig. 9 Tree of processors. Each processor is represented as a box, which can be connected to one other. In this tree, Inner Hair Cell is the child of Filterbank, and Filterbank is then the parent of Inner Hair Cell. Vertical concurrency: while a processor works on a resource delivered by its parent, the parent can already prepare the next resource. This kind of concurrency concerns for instance the Input processor, the Pre-processor, the gammatone processor and the IHC processor in Fig. 9. Horizontal concurrency: children of a processor are mutually independent and can process concurrently their parent’s output. This kind of concurrency concerns the cross-correlation processor, the ILD processor and the Ratemap processor in Fig. 9, all of them having the same parent (the IHC processor). Fig. 10 State machine and memory management of a processor. release: Once all children are done processing the previous output resource, the processor can release the new one: it copies the content of its private memory zone to its shared memory zone. Additionally to these 4 functional states, the implementation requires the definition of the start, stop and delete states to respectively initialize, stop and remove a processor from the processing tree. These are not represented in Fig. 10. On this basis, processors concurrency is implemented the following way. while in waitRelease state, processor 2 needs a token issued after the process state of its child (processor 3) in order to fire the transition to the release state. This functioning is summarized in Fig. 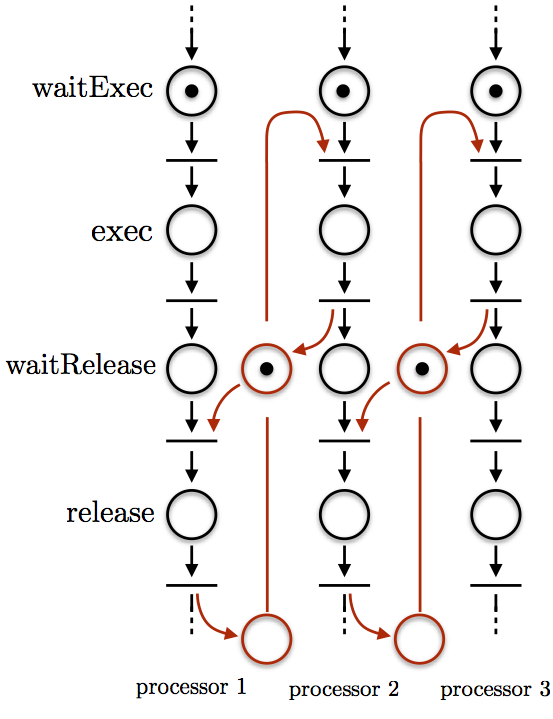 11.
when the parent processor parent leaves its release state, it issues individual tokens allowing each child (child 1 and child 2) to fire the transition from waitExec to exec state. once a child leaves its Process state, it issues one token. 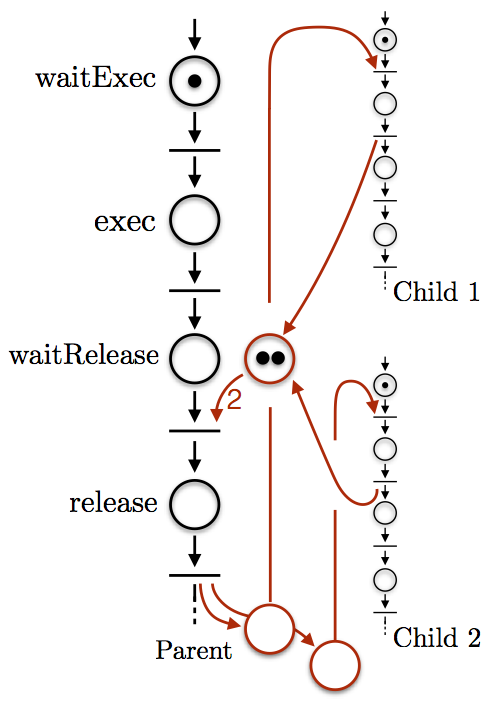 The parent processor needs as many tokens as it has children (two, here) to fire the transition from waitRelease} to release state. This is summarized in Fig. 12. Fig. 12 Petri net for a parallel chain of processors, highlighting horizontal concurrency between 2 processors. Differently from the MATLAB implementation of the AFE, a GenoM3 module enables concurrent processing. In view of the many concurrency and synchronization properties previously outlined, GenoM3 facilitates the specifications writing and the development of the ROS AFE thanks to the synthetic description of the module in a text file and the automatic generation of real time code for ROS. activities, implementing the algorithmic core of the module. tasks, in which an activity is executed. internal data structure (IDS), which allows to share data between tasks of the component. ports, which implement the data flow between components as a publish/subscribe model. and functions, which are dedicated to small operations which should be executed and finished almost instantaneously. Available processors in /rosAFE are listed in the processing tree shown in Fig. 9, which also exhibits the dependencies between them. /rosAFE can compute as many audio representations as needed. However each processor must have a unique name. This name is given by the user while requesting the processor and can not be changed after. /rosAFE still requires the user to setup the processing tree by hand, i.e. by creating each successive processors to obtained the requested audio representation. This requirement is relaxed when using the Matlab client to /rosAFE, see the Matlab client to rosAFE section. Setting a processors tree then requires each processor instantiation to contain the name of its first dependency, i.e. must specify to which output its input is connected to. In this guide, eltclsh is used to communicate with the ROS/GenoM3 nodes. eltclsh acts as a TCL client to ROS via genomix, and can be used to send requests to every component it is connected to. Setting up eltclsh is easy and only requires to load a specific TCL module coming up with all the robotic tools. Now, you should connect the output port of BASS to the input port of the /rosAFE. The parameters used in the above command are documented in the BASS section and can be changed accordingly. The file rosAFE.gen in the root of the repository directory contains the definitions and the descriptions of the services offered by /rosAFE. This section lists them and provides additional details concerning their parameters. This service is used to launch the InputProc processor, which loads the raw audio signals coming from BASS to /rosAFE. The connection between the output Audio port of BASS and the input port of the /rosAFE must be established before requesting this service. This service is used to launch the PreProc processor. This service is used to request an Inner Hair Cell representation. This service is used to request an Interaural Level Difference processor. This service is used to request a Ratemap processor. This service is used to request a CrossCorrelation processor. This service is dedicated to on-the-fly processor parameters modifications. This service returns the names of processor dependencies from the Input Processor to the requested processor. This service allows to have access to the new audio representations computed by all currently running processors. The function doesn’t have any input parameter. The buffer size of this function is set by the user while requesting the Input Processor, see above. Requesting the outputs of all running processors is very demanding. All data must transit from the processor outputs to the user through the genomix interface, i.e. by using TCP/IP connections in between. It is then often a good idea to not set a too big buffer to this function. If a single processor output is needed, please use instead the available output ports (see below). The user may delete any processor any time, except the input processor. If the deleted processor was the dependency of some other processor (e.g. if it was the father of some another processors), all are destructed as well. The getSignal service mentioned above allow to reach all the computed auditory representations. In parallel, each processor acts like a server and publishes its outcome on an individual port. The size of this port is set by the user while requesting the Input Processor. Since those ports are published directly to the ROS environment, both native ROS and TCL commands from eltclsh can read them. Type the following command on a terminal to see all available ports. Lets say there is a port called */rosAFE/preProcPort/dummyName*. The user can then use the commands listed in Table 16 to access the ports data and statistics. The following code will print the output of the processor to the eltclsh screen. Modify this code according to your needs by using Table 17. Instead of eltclsh, all the commands mentioned above can be directly called from within Matlab. To do so, use the following indications. Do not forget to check your input device ID, see Writing a client of BASS.